Home » Sectors » Agriculture » Poor Mr Narayana Murthy! I read this article and found it very interesting, thought it might be something for you. The article is called Poor Mr Narayana Murthy! 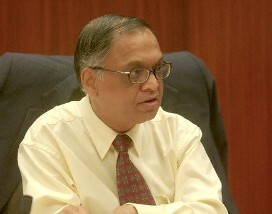 and is located at https://archive.indiaspend.com/sectors/poor-mr-narayana-murthy-98912. The bountiful state of Karnataka has some 13 million households as per the census rolls. It would stand to reason that poor families (who need subsidised food grain) constitute a percentage of this figure. Actually, the figure is over 100%. Put another way, there are almost 15 million households which classify as poor and thus entitled to food grain subsidies, which is more than Karnataka’s population. Put differently, all the tech billionaires we know of, including Infosys Founder N R Narayana Murthy who reside in Bangalore are poor. Obviously, saying that Mr Murthy is a ‘below poverty line’ resident is a joke (for which we apologise in advance!) but the state of our databases is not. Karnataka is not the only state with wonky databases. Several other states have more poor people than people. Himachal Pradesh has a population of 6.9 million (2011 Census) but 7.4 million claimants to food subsidies. Goa had a population of 1.3 million (2001 census) and 1.6 million recipients of subsidies. Amazingly, this glaring discrepancy is almost a way of life. States like Madhya Pradesh, Andhra Pradesh and Karnataka are waging a war to clean up databases. We wish them good luck.